Closely resembling the Wolf Spider, Nursery Web spiders are light brown in color with a darker brown stripe down the middle of their bodies. They can run over still water surfaces, and even dive underwater for short periods of time. Nursery Web Spiders do not build webs to catch food, but hunt instead. They are called "Nursery Web Spiders" because they build a web around their egg sac and stand guard to protect it. 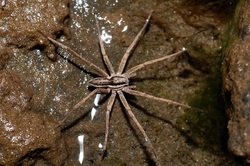 Nursery Web Spiders like to live in moist areas outdoors, and can sometimes been seen inside homes. Click here for information about the Wolf Spider!